Make some new mates at the end of the world. 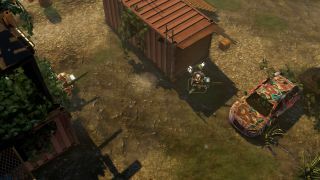 Dreadlands is a post-apocalyptic tactics game where you command and customise a squad of wasteland warriors and send them out into the world to fight over resources in turn-based brawls. But you won't be alone. You're sharing the world with other players who can join you in PvE co-op or try to murder your squad in PvP battles. Just what I always wanted—a bigger audience for my many tactical mistakes. "With Dreadlands we want to take the online elements of an MMO or a shared world shooter and combine it with addictive turn-based gameplay" says Peter Nilsson, founder and creative director Blackfox Studios. It's not from the first time that strategy and tactics have collided with MMOs, but I confess I'm hard-pressed to come up with any success stories. It sounds like everyone will be on this one shared world, managing their squads, upgrading their bases, unlocking new tactics and creating deadly toys to play with in the turn-based scraps. It's not clear, however, if these bases will simply be a place for you to tweak your squad or if they'll be in-game locations that could be attacked by other players. I love a good siege, so fingers crossed it's the latter. Dreadlands is set in Fatshark's Krater universe, an action-RPG I definitely played but can tell you absolutely nothing about. Hopefully its successor, which is being developed by Blackfox Studios, will stick in my memory for longer. Details are still pretty slim, but with it due out in 2019, expect to find out more soon. In the meantime, here's the official site.